Explosion Proof Motor Starter - Solution Control Systems Inc. Explosion Proof Motor Starter - Solution Control Systems Inc. 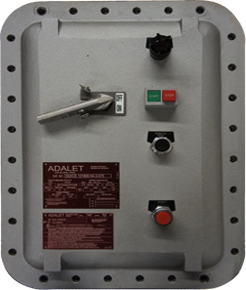 Features such as pilot devices, disconnect handles and viewing windows can be added to the door of these motor starters upon request and compliance of requirements. If you need a local START/STOP starter, then a manual motor starter in an explosion proof enclosure may be able fulfill your requirement – and be much more economical. Solution Controls can provide assistance in wiring this motor starter to your motor or control system by suggesting the correct types of cables and connectors, as well as the most efficient and effective installation methods.